CD8+ T cells respond to Ags when their clonotypic receptor, the TCR, recognizes nonself peptides displayed by MHC class I molecules. The TCR/ligand interactions are degenerate because, in its life time, the TCR interacts with self MHC class I-self peptide complexes during ontogeny and with self class I complexed with nonself peptides to initiate Ag-specific responses. Additionally, the same TCR has the potential to interact with nonself class I complexed with nonself peptides. How a single TCR interfaces multiple ligands remains unclear. Combinatorial synthetic peptide libraries provide a powerful tool to elucidate the rules that dictate how a single TCR engages multiple ligands. Such libraries were used to probe the requirements for TCR recognition by cloned CD8+ T cells directed against Ags presented by H-2Kb class I molecules. When H-2Kb contact residues were examined, position 3 of the peptides proved more critical than the dominant carboxyl-terminal anchor residue. Thus, secondary anchor residues can play a dominant role in determining the antigenicity of the epitope presented by class I molecules. When the four solvent-exposed potential TCR contact residues were examined, only one or two of these positions required structurally similar residues. Considerable structural variability was tolerated at the remaining two or three solvent-exposed residues of the Kb-binding peptides. The TCR, therefore, requires close physico-chemical complementarity with only a few amino acid residues, thus explaining why TCR/MHC interactions are of low affinity and degenerate. The control of T cell responses by the classical MHC-encoded Ag-presenting molecules is termed MHC restriction (1). MHC restriction entails the presentation of Ag in the form of processed short peptides by the MHC molecules to T cells. MHC class I molecules control the development and function of CD8+ CTL. Class I molecules accomplish their function by chaperoning short intracellular peptides of 8 to 12 aa residues to the cell surface, thus displaying the class I-peptide complexes for an appraisal by circulating CD8+ T cells (reviewed in 2 . A molecular basis for MHC restriction has emerged from solving numerous three-dimensional structures of class I molecules (reviewed in 3 . The heterotrimeric class I molecule consists of the highly diverse heavy chain, the invariant light chain β2-microglobulin (β2m),3 and a peptide. The α1 and α2 domains of the heavy chain fold in such a manner that they form an Ag-binding groove confined on the sides by two α-helices and at the bottom by two β-sheets of four antiparallel β-strands each. Peptide Ags bind within this groove. The α3 domain of the heavy chain and β2m attain an Ig-like fold; β2m is noncovalently associated with the α1, α2, and α3 domains (4, 5). Peptides bind the Ag-binding groove through hydrogen-bonding interactions between the side chain atoms of the conserved residues of pockets A and F of the heavy chain and the main chain atoms of the amino-terminal amine and the carbonyl oxygen of the carboxyl terminus of the peptide, respectively (6, 7, 8, 9, 10). Peptides that bind class I molecules contain structurally conserved residues at the carboxyl terminus (PΩ) and at an additional internal position. A combination of these conserved residues within peptides constitutes the class I binding motif (11, 12, 13). Thus H-2Kb class I molecules bind peptides that predominantly contain phenylalanine (Phe) or tyrosine (Tyr) at position (P) 5 and a hydrophobic aliphatic residue (e.g., valine (Val), leucine (Leu), and isoleucine (Ile)) at PΩ (11, 12, 14). Peptide binding studies using single amino acid variants of antigenic peptides have revealed secondary anchors required for effective binding (15, 16, 17). In the case of H-2Kb, residues at P2 and P3 serve as secondary anchors (15, 18). The crystal structure of class I molecules also revealed that the majority of the amino acid residues that vary among class I allelic products are those that contact the bound peptide by virtue of their location in the Ag-binding groove. Thus the physico-chemical nature of the Ag-binding groove dictates the anchor motif required for specific peptide binding to a class I molecule (5, 19, 20). In the three crystal structures of H-2Kb molecules complexed with different octameric peptides, the dominant anchors, P5 Phe or Tyr, and the PΩ Leu are completely buried in the groove (8, 9, 21). Of the secondary anchors, those at P2 are tucked into pocket B, and those at P3 are almost completely buried within pocket D of the Ag-binding groove (8, 9, 21), consistent with the view that they can influence peptide binding to H-2Kb. Thus, in octameric peptides displayed by H-2Kb, residues at P2, P3, P5, and PΩ are in intimate contact with the class I molecule; the side chains at the remainder of the peptide, i.e., at P1, P4, P6, and P7, are solvent exposed and potentially accessible to the TCR (8, 9, 21). Functional studies have suggested that the TCR interacts with a composite structure of the class I-peptide complex in an orientation diagonal to the α-helices (22). In addition to confirming these aspects of the TCR/class I-peptide interaction, the two recently solved crystal structures of the TCR cocomplexed with its cognate ligand, H-2Kb-self peptide in one and HLA-A2-HIV tax peptide in the other, also revealed that the TCR interfaces Ag through its complementarity determining regions (CDR) 1, 2, and 3 of the Tcrα- and Tcrβ-chains (23, 24). Of these six CDRs, CDR3 makes the majority of the contacts with the bound peptide (23), consistent with the fact that CDR3α, CDR3β, and the peptide are the most variable parts of the interacting surfaces. X-ray crystallographic analyses of TCR/class I-peptide complexes have provided an in-depth view of how these marcomolecules interact with each other. However, it provides a static snap-shot of the most thermodynamically favored structure of the interacting molecules. Therefore, further structure function analyses are required to understand how the TCR interacts with its ligand. Combinatorial libraries provide a powerful tool for probing the interfaces of two interacting macromolecules (25, 26, 27, 28, 29, 30, 31). In this study, combinatorial peptide libraries were used to gain insight into the role of H-2Kb contact and TCR accessible residues in Ag presentation and recognition. The results revealed that the display of Ag to the TCR critically depended on the class I-contact residue at P3 of the peptide. In several instances the amino acid residue at P3 was more critical than the dominant PΩ anchor. Additionally, the TCR requires only one or two TCR-contact residues of the peptide to achieve specificity, while it can interact with multiple structurally dissimilar amino acids of the remaining solvent-exposed residues. Although the critical TCR contact residues seemed predisposed to the carboxyl terminus of the peptide, the position of these residues was T cell, therefore TCR, dependent. The requirement for only a few specific TCR contact residues within the peptide explains why TCR/MHC-peptide interactions are of low affinity and degenerate. RMA cells (32) were used as targets in cell-mediated lympholysis. These cells were maintained in RPMI 1640 (Life Technologies, Gaithersburg, MD) supplemented with 5% heat-inactivated FCS, 100 U/ml penicillin, and 100 μM streptomycin. The H-2Kb-restricted, H-4b-specific CTL line M9 was isolated from C57BL/10 mouse, primed, and restimulated with H-4-congenic B10.129-H-4b (21 M) splenocytes. A cloned line was established and maintained with weekly stimulation using irradiated 21 M-derived spleen cells in the presence of 30 U/ml recombinant IL-2, as described (33). The H-2Kb-restricted, gB-specific CTL clone 2D5 and the RR1-specific CTL clone 1D11 were derived from splenocyte populations of HSV-I immunized C57BL/6 mice (34, 35). Both the 2D5 and 1D11 CTL clones were maintained with 10% Rat T-Stim culture supplement (Collaborative Biomedical Research Products, Bedford, MA) along with 0.05 M α-methyl-d-mannoside (Sigma, St. Louis, MO) and stimulated with mytomycin C-treated, HSV-I-infected B6/WT-3 cells (36), as described previously (34, 35). All combinatorial peptide libraries were produced by automated solid phase F-moc synthesis (Chiron Technologies, Emeryville, CA). The peptide libraries were synthesized with Phe at P5 in all cases and either a single amino acid except Cys at defined positions (solid circles in the Figures) or with equimolar mixtures of all naturally occurring l-amino acids except for Cys for randomized positions (x). The peptide preparations were controlled for purity by random amino acids analysis, reversed-phase chromatography, and electrospray-ionization mass spectrometry (Chiron Technologies). Stock solutions of the peptide were prepared in DMSO at ∼20 mg/ml. All peptides were diluted in RPMI 1640 containing 5% FCS for the CTL assay. Note that heat-inactivated FCS has low concentrations of proteases, hence suggested for use in cell cultures where peptide stability is important (37). For libraries 1 through 6, 5 μl of peptide library stock were resuspended in 1.3 ml RPMI 1640 (∼76.9 μg/ml) whereas 5 μl of stock of libraries 7 through 11 were resuspended in 1 ml RPMI 1640 (100 μg/ml) and used to sensitize 51Cr-labeled RMA cells. The number of peptides in each library and the concentration of individual peptides in each library in the assay are presented in Table I⇓. Chromium release assays were performed according to standard protocols. The E:T ratios for H-4b-specific, gB-specific, and RR-1-specific CTL assays are described in the Figure⇓ legends. RMA target cells (2 × 105 cells/ml) were preincubated for 2 h with an equal volume of peptide solution in RPMI 1640 supplemented with 5% FCS (see Table I⇑ for final peptide concentration in the assay). After 2 h at 37°C, an equal volume of effector cells in RPMI 1640 supplemented with 5% FCS was added and incubated at 37°C for 5 to 6 h in V-bottom, 96-well plates. One half of the supernatant in each well (∼100 μl) was harvested and monitored for radioactivity (Beckman, Fullerton, CA). Specific lysis was calculated as the percentage of the ratio of the difference between the experimental and the spontaneous release to the difference between the maximum and the spontaneous release. The residue at P3 is critical for the presentation of the H-4b minor H Ag-derived epitope by H-2Kb to specific CTL. A, Identification of the PΩ anchor in the H-4b-derived epitope using a synthetic combinatorial peptide library 1. Library 1 consists of six sets of octameric peptides in which × denotes a mixture of the 20 natural l-amino acids except Cys and each set of 47,045,881 possible peptides is distinguished by the amino acid residue represented at PΩ. RMA cells do not express the H-4b minor H Ag and hence were used as the APCs. RMA cells pulsed individually with each of the six sets of peptides were used in a standard 51Cr release assay to determine the PΩ anchor for the unknown H-4b-specific CTL epitope. None of the peptide sets were recognized by the H-4b-specific CTL clone. B, Second to the dominant P5F anchor, the residue at P3 is more critical than the PΩ anchor in the presentation of H-4b Ag to specific CTL. RMA cells pulsed individually with each of the 11 sets of peptides of library 2 were probed with H-4b-specific CTL clone. Library 2 is nonameric with a carboxyl-terminal Gly extension. Each set of 14,856,594 possible peptides is distinguished by the indicated amino acid residue at P3. × denotes a mixture of the 20 natural l-amino acids except Cys. z at P8 indicates a mixture of Phe, Ile, Leu, Met, Val, and Tyr. The peptide set with an Ile residue at P3 was recognized by H-4b-specific CTL. C, The H-4b-specific CTL clone did not recognize RMA cells pulsed with peptides represented in library 3. Library 3 is identical to library 1 but is extended by a Gly residue at the carboxyl terminus. The E:T ratio used for testing libraries 1, 2, and 3 was 25:1. The data represented in the three panels are results of a single experiment that was repeated at least twice. The approach taken to define the rules for peptide Ag presentation by class I molecules to specific CTL was to probe synthetic combinatorial peptide libraries displayed by H-2Kb with a CTL clone whose epitope is unknown. Thus, an H-2Kb-restricted minor histocompatibility (H) H-4b Ag-specific CTL clone (38) was used to avoid bias from the knowledge of its epitope. The only bias laid in the synthesis of the combinatorial library was the use of an invariant Phe at P5 that is essential for the binding of peptides to H-2Kb molecules (11, 14). The rules thus gleaned were further tested using two viral Ag-specific CTL clones whose epitopes have been already established (34, 35). The initial goal was to determine the role of PΩ anchor residue in H-4b Ag presentation. Thus, library 1 consisting of octameric peptides with an invariant Phe at P5 (P5F), all naturally occurring l-amino acids except cysteine (Cys) at P1, P2, P3, P4, P6, and P7, and either Phe, Ile, Leu, methionine (Met), Tyr, or Val at PΩ (Fig. 1⇑A), was used to determine the PΩ anchor. Cys was omitted to avoid complications that could arise from covalent modification of the free sulfydryl group of this residue. The resulting library consisted of six sets of peptides distinguished by the amino acid residue at PΩ and contained 47,045,881 peptides per set. Peptides were presented to the H-4b-specific CTL clone by RMA cells (described in Materials and Methods); RMA cells express H-2KbDb molecules of C57BL/6 origin but do not express the BALB.B-derived H-4b minor H Ag (data not shown). The H-4b-specific CTL recognizes H-2Kb overexpressed by a BALB/c-derived plasmacytoma, Kb-high (39) (data not shown). Surprisingly, none of the six peptide sets within this library were recognized by the H-4b-specific CTL clone (Fig. 1⇑A). Peptides in library 1 may not have sensitized H-4b-specific CTL targets for the following reasons. First, the peptides in the library may have been insoluble, hence not presented to the CTL. However, all six peptide sets in library 1 were presented equally well to a C57BL/6-derived polyclonal population of CTL directed against at least four distinct H-2Kb-restricted minor H Ags, including H-4b, of BALB.B origin (data not shown). Thus, solubility is less likely to be the reason why this CTL clone did not recognize peptides of library 1. Second, concentration of individual peptides in library 1 might have been too low to sensitize target cells for lysis by the H-4b-specific CTL clone. However, the low concentration of peptides in library 1 may not be the reason for the lack of recognition. This conclusion is based on the fact that the polyclonal CTLs raised in C57BL/6 mice against BALB.B splenocytes recognized peptides in library 1 very efficiently (40% specific lysis; data not shown). Moreover, peptide library 1 is recognized with a high efficiency by a CTL clone directed against HSV-I ribonucleotide reductase (RR-I)-derived epitope (described below; see Figure 5⇓). Thus, neither concentration nor solubility could account for the lack of recognition of peptides in library 1 by the H-4b-specific CTL clone. The third plausible reason why the H-4b-specific CTL clone did not recognize library 1 is that a critical amino acid residue at another position, presumably a secondary anchor residue, is essential for the proper presentation of the epitope to CTL. To test this hypothesis, library 2 was synthesized, which consisted of eleven sets of peptides extended by a glycine (Gly) residue at the carboxyl terminus and P5F as the conserved anchor. Note that the carboxyl terminus of peptide library 2 was extended to facilitate the synthesis of peptides with multiple residues at the original PΩ anchor residue but was not meant to replace the PΩ anchor, which is at P8 of Kb-binding peptides. That the Gly-extended libraries did not replace the PΩ anchor is substantiated by the crystal structure of HLA-A2 complexed with a decamer peptide that has an additional Gly residue at P10 of a naturally processed nonamer peptide (40). In this structure, Gly at P10 extended out of the Ag-binding groove without replacing the original PΩ anchor at P9 (40). The naturally processed peptides longer than nonamers bind HLA-A2 with high affinity (41) and are stable at the physiologic temperature (40). Thus, we predicted that the extension of a normally octameric peptide epitope(s) by a Gly at the carboxyl terminus could provide a combinatorial library to test the role of a hitherto unknown secondary anchor. Library 2 is distinct from library 1 in that it consists of a mixture of Phe, Ile, Leu, Met, Tyr, and Val at P8 and has one of the following eleven amino acids, alanine (Ala), Phe, Gly, Ile, Leu, Met, asparagine (Asn), proline (Pro), glutamine (Gln), Val, or Tyr, at P3. The residues at P3 distinguish each peptide set in library 2 (Fig. 1⇑B). The choice of residues at P3 was based on the already known anchor motif of H-2Kb-binding peptides (11, 14). The remaining positions, P1, P2, P4, P6, and P7, of the peptide contained all naturally occurring l-amino acids except Cys (Fig. 1⇑B). One peptide set, distinguished by the presence of Ile at P3 (P3I), among the eleven sets of peptides in library 2 was recognized by the H-2Kb-restricted, H-4b-specific CTL clone (Fig. 1⇑B). To determine whether the Gly extension at the carboxyl terminus contributed to the CTL activity of the peptides in library 2, library 3 was synthesized. It is essentially similar to library 1 but extended by a Gly residue at the carboxyl terminus (Fig. 1⇑C). 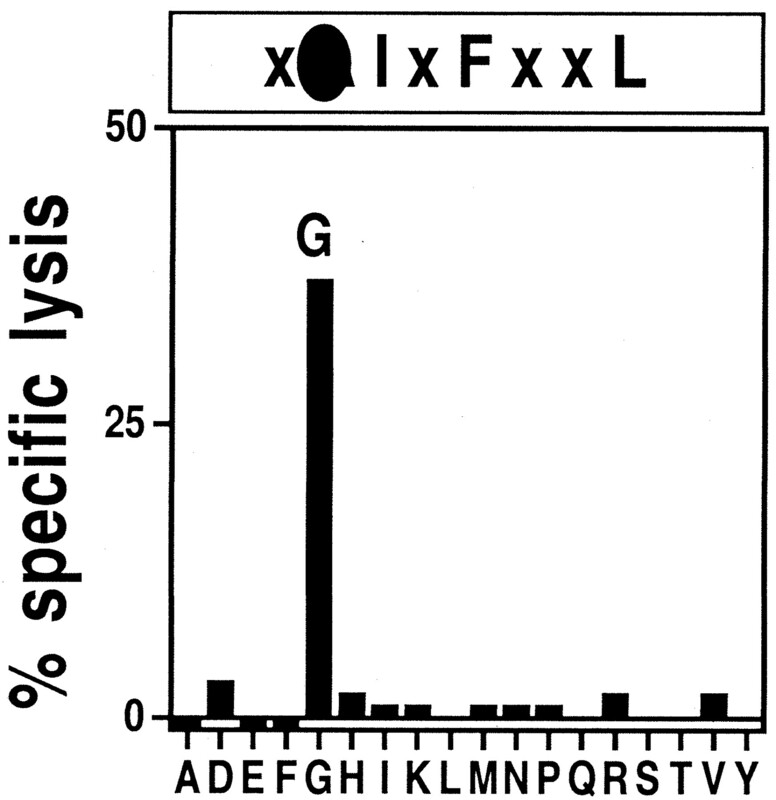 Although this library was presented to the polyclonal CTL against minor H Ags described above (data not shown), none of the six sets of peptides in library 3 were recognized by the H-4b-specific CTL clone (Fig. 1⇑C). Hence, the Gly extension does not contribute to the recognition of peptides in library 2 by H-4b-specific CTL clone. Together the data suggest that the amino acid residue at P3 can critically affect the presentation of peptide Ags by class I molecules to specific CTL. PΩ anchor of H-4b-derived CTL epitope. To determine the amino acid residue(s) at P2 in the H-4b-derived epitope, the PΩ anchor of H-4b Ag had to be defined. Therefore, library 4 of octameric peptides was constructed. It consists of five sets of peptides related to each other by virtue of containing P3I and P5F. The peptide sets are distinct from each other because each set of 2,476,099 peptides contains Phe, Ile, Leu, Met, or Val at PΩ (Fig. 2⇓A). P1, P2, P4, P6, and P7 are degenerate, containing all the natural l-amino acids but Cys (Fig. 2⇓A). Once an invariant amino acid residue was fixed at P3 (P3I) in the peptide library, the residue at PΩ was easily identified. Thus the H-4b-derived epitope consists of either Val, Leu, or Ile at PΩ (Fig. 2⇓A). Additionally, two similar libraries, P3G-containing library 5 (Fig. 2⇓B) and P3F-containing library 6 (Fig. 2⇓C), consisting of four and five octameric peptide sets based on the different amino acid residues at PΩ, respectively, were not recognized by the H-4b-specific CTL clone (Fig. 2⇓B and 2C). These data further emphasize the stringent requirement of P3I in the structure of the H-2Kb-restricted H-4b epitope. Hydrophobic aliphatic residues are PΩ anchors in H-4b-specific CTL epitope. 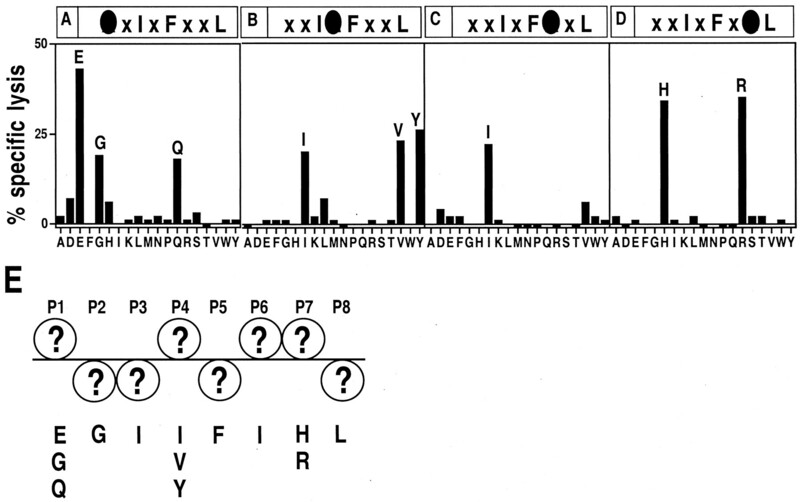 The PΩ anchor in the H-4b-specific CTL epitope was determined using the combinatorial peptide library 4 (A) in which all peptides consisted of P3I, P5F, and either Phe, Ile, Leu, Met, or Val at PΩ. RMA cells pulsed with library 4 were recognized by H-4b-specific CTL clone only when the 2,476,099 peptides per set contained Ile, Leu, or Val at PΩ, of which PΩV was recognized best. Consistent with the importance of the nature of the amino acid residue at P3, H-4b-specific CTL clone did not recognize RMA cells pulsed with libraries 5 and 6; libraries 5 and 6 are similar to library 4 except that they either contain peptides with P3G (library 5; B) or P3F (library 6; C). × denotes a mixture of the 20 natural l-amino acids except Cys. The E:T ratio used to test libraries 4, 5, and 6 was 25:1. This assay was repeated at least twice with similar results. Secondary anchor at P2 of H-4b epitope is invariant. The crystal structures of the three H-2Kb-restricted epitope complexes revealed that the amino acid residue at P2 is oriented toward pocket B and completely buried in the H-2Kb groove (8, 9, 21). Thus, the residue at P2 could serve as a secondary anchor critical for the presentation of peptide Ag to specific CTL. This prediction was tested using library 7. It consisted of 18 sets of 130,321 octameric peptides distinguished by one of the 20 natural l-amino acids except Cys and tryptophan (Trp; Figure 3⇓) at P2. Trp was omitted because none of the H-2Kb-restricted peptides reported to date contain this residue at P2 (13). Additionally, peptides in library 7 consisted of invariant P3I, P5F, and PΩL and all natural l-amino acids except Cys at P1, P4, P6, and P7 (Fig. 3⇓). Note that, although Ile, Leu, and Val could be used as the PΩ anchor, PΩL was chosen because Leu is most frequently used as the carboxyl terminus amino acid residue in peptide epitopes presented by H-2Kb molecules (11, 13). The results revealed that the H-4b-derived epitope accommodates only Gly at P2, without affecting CTL recognition (Fig. 3⇓). Thus, the secondary anchor at P2 of H-4b-specific CTL epitope is invariant. A conserved amino acid residue is accepted at P2 in the H-4b-specific CTL epitope. RMA cells were individually pulsed with each of the 18 peptide sets (130,321 peptides per set) belonging to library 7 and tested for recognition by H-4b-specific CTL clone. Each set in this library is distinguished by the amino acid residue at P2 (one of the 20 natural l-amino acids except Cys and Trp). Only those targets pulsed with the peptide set containing P2G was recognized by H-4b-specific CTL clone. ×, denotes a mixture of the 20 natural l-amino acids except Cys. The E:T ratio used to test library 7 was 15:1. This assay was a part of the experiment presented in Figure 4⇓; it was repeated at least twice with similar results. Both functional and crystal structure studies of three H-2Kb-restricted antigenic peptides have revealed that amino acid residues at P1, P4, P6, and P7 are solvent exposed and oriented in space in a manner accessible by specific TCR (8, 9, 21). The amino acid structure requirements of the four putative TCR-accessible residues for H-4b Ag recognition were determined using libraries 8, 9, 10, and 11. These libraries were similar to library 7 in that the 123,462 peptides in each library contained P3I, P5F, and PΩL. In addition, three of the four putative TCR contact positions and P2 contained a mixture of all the natural l-amino acids except Cys while the fourth position contained one of the 20 natural l-amino acids except Cys (Fig. 4⇓). Thus library 8 has one of the 20 natural l-amino acids except Cys at P1 and a mixture of all of the natural l-amino acids except Cys at P2, P4, P6, and P7, and so on (see Figure 4⇓). Of the four putative TCR contact residues, a structurally invariant residue is present at one position in the H-4b-specific CTL epitope, while the remaining positions accommodate structurally dissimilar amino acids. RMA cells were pulsed with peptide libraries 8, 9, 10, and 11; each library consisted of 19 sets and each set consisted of 123,462 peptides. Each peptide set is distinguished by the amino acid represented either at P1 (library 8; A), P4 (library 9; B), P6 (library 10; C) or P7 (library 11; D). Peptide-pulsed RMA cells were tested for their ability to sensitize targets for the H-4b-specific CTL clone. × denotes a mixture of the 20 natural l-amino acids except Cys. × at P2 denotes a mixture of the 20 natural l-amino acids except Cys and Trp. The E:T ratio used to test libraries 8, 9, 10, and 11 was 15:1. The experiments in all four panels were performed in a single assay and were repeated twice with similar results. E, A schematic representation of the H-4b-specific CTL epitope. The predicted TCR-contact residues are positioned above the line while those that interact with H-2Kb are below the line. The amino acid residue (single-letter code) at each position in the peptide recognized by the H-4b-specific CTL clone is indicated below the schematic. ?, H-4b epitope is undefined. H-2Kb-restricted, H-4b-specific CTL clone recognized multiple peptides represented within the last four libraries (Fig. 4⇑). It recognizes peptides containing multiple structurally distinct amino acid residues at P1 (Glu, Gly, and Gln), P4 (Ile, Tyr, and Val) and P7 (arginine (Arg) and histidine (His); Fig. 4⇑, A–C). However, this CTL clone recognizes Ag only when it contained an invariant Ile at P6 (Fig. 4⇑D). Thus, although degenerate, the specific TCR interfaces Ag only when presented with a common structurally conserved amino acid residue at one position in the CTL epitope that is solvent exposed and accessible to the TCR (Fig. 4⇑E). How general are the rules? The generality of the rules regarding H-2Kb-restricted Ag presentation and recognition defined using the H-4b-specific CTL clone were further tested using two CTL clones whose epitopes are known. One CTL clone is specific for an immunodominant herpes-simplex virus (HSV)-I’s glycoprotein B (gB)-derived epitope, SSIEFARL (35). The second CTL clone is directed against an immunorecessive HSV-I’s ribonucleotide reductase-1 (RR-1)-derived epitope, QTFDFGRL (34). These two CTL clones were chosen because both their epitopes contain P5F and PΩL, while one contains P3I (gB) and the other contains P3F (RR-I) (34, 35). The gB- and RR-1-specific CTL clones do not recognize RMA cells unless pulsed with their respective epitopes (data not shown); they are sensitive to picomolar amounts of the peptide (34, 35). The stringent requirement of an invariant residue at P3 observed with H-4b-specific CTL clone was tested using the RR-1-specific CTL clone. Unlike H-4b-specific CTL clone, the RR-1-specific CTL clone recognized library 1 (Fig. 5⇓A) but did not recognize libraries 2 and 3 (data not shown). In fact, P3F of the native epitope could be substituted by Gly or Ile without affecting recognition by RR-1-specific CTL clone (Fig. 5⇓, B, C, and D). Although RR-1-specific CTL clone recognized peptide library 6 containing P3I, it did not significantly recognize any of the peptides represented in libraries 7 and 8; the peptides in these two libraries contained invariant P3I, P5F, and PΩL (Fig. 5⇓, E and F). Note that the background in the assay presented in Figure 5⇓ was high; in a repeat of the experiment using libraries 7 and 8, none of the peptide sets in these two libraries were recognized (data not shown). Additionally, multiple structurally distinct residues, including those not represented in the native epitope, were recognized by the RR-1-specific CTL clone when used to probe libraries 9, 10, and 11, which also contained P3I, P5F, and PΩL (Fig. 5⇓, G, H, and J). 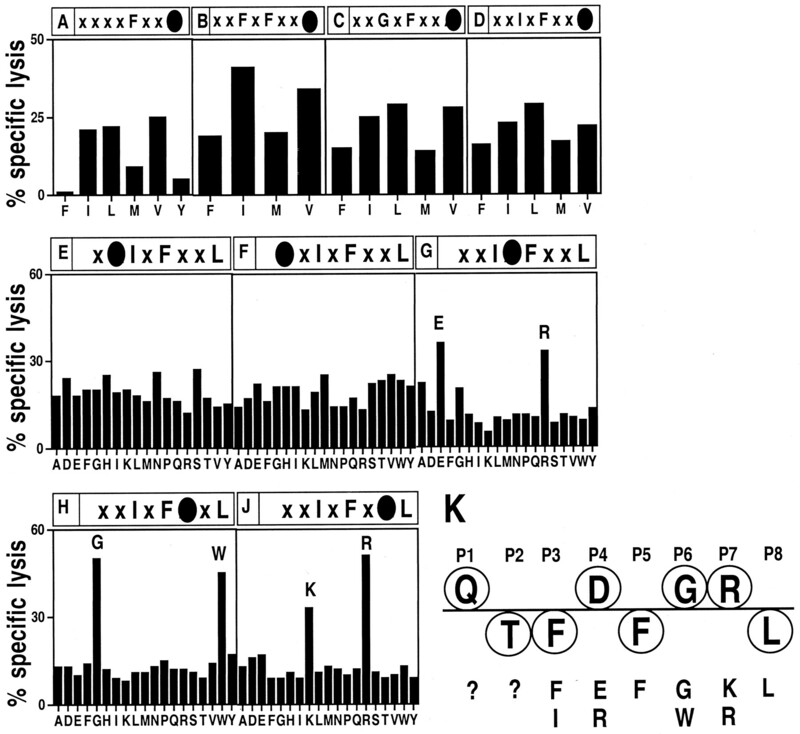 A summary of the RR-1-specific CTL recognition pattern is represented in Figure 5⇓K. Together with the H-4b-specific CTL recognition pattern, these data suggest that the residue at P3 critically affects Ag presentation by H-2Kb to specific CTL. Recognition of the natural H-2Kb-restricted HSV-I RR-1-specific CTL epitope is critically dependent on the structure of the amino acid residue at P3. RMA cells pulsed with peptides represented in the combinatorial libraries 1 (A), 4 (B), 5 (C), 6 (D), 7 (E), 8 (F), 9 (G), 10 (H), and 11 (J) were probed with RR-1-specific CTL clone whose epitope (QTFDFGRL) is already known. The libraries used in this experiment are explained in the legends to Figures 1 through 4⇑⇑⇑⇑ and are indicated in each panel. Note that the RR-1 epitope can be recognized with different amino acid residues at P3 (A–D). 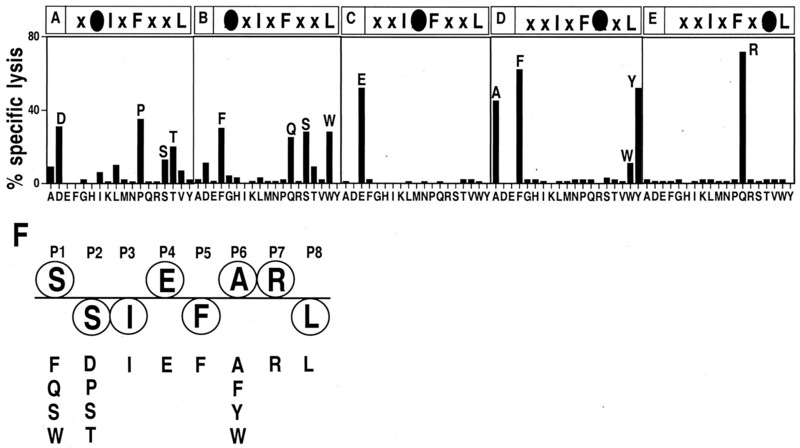 However, the recognition of the native epitope QTFDFGRL is critically dependent on P3F because P3I peptide libraries 7 (E) and 8 (F) containing one of the 20 natural l-amino acids, except Cys (P1 and P2) and Trp (P2), at P1 and P2, respectively, were not recognized by the RR-1-specific CTL clone. Additionally, residues not at all represented in the native epitope (Glu and Arg at P4; G) and structurally distinct residues (Gly and Trp at P6; H) were recognized by the RR-1-specific CTL clone. E:T ratio used to test libraries 1, 4, 5, and 6 (A–D, respectively) was 25:1. E:T ratio used to test libraries 7, 8, 9, 10, and 11 E–H and J, respectively) was 5:1. The data presented are representative of two similar assays. K, A schematic representation of the RR-1-specific CTL epitope. The amino acid residue at each position in the peptide recognized by the RR-1-specific CTL clone is indicated below the schematic. The native RR-1 epitope is indicated inside the circles. Unlike the H-4b- and RR-1-specific CTL clones, none of the peptides within libraries 1 through 6 were recognized by the gB-specific CTL clone (data not shown); note that these libraries have fixed anchors only at P5 and PΩ or at P3 and P5. However, peptides within libraries 7 through 11, containing P3I, P5F, and PΩL as invariant residues, sensitized targets for recognition by this CTL clone (described in detail below; Figure 6⇓). This suggests that the three anchors P3I, P5F, and PΩL together are essential in presenting the gB-derived epitope to specific CTL. Of the four putative TCR contact residues, structurally invariant residues are present at two positions of the H-2Kb-restricted HSV-I gB-specific CTL epitope, while the remaining positions accommodate structurally dissimilar amino acids. RMA cells were pulsed with peptide libraries 7 (A), 8 (B), 9 (C), 10 (D), and 11 (E) and tested for their ability to sensitize targets for a gB-specific CTL clone. The libraries used in this experiment are explained in the legends to Figures 3⇑ and 4⇑ and are indicated in each panel. Note that the native gB-specific CTL epitope SSIEFARL is represented within the numerous mimotopes identified. E:T ratio used in these experiments was 5:1. The experiments in all four panels were performed in a single assay and were repeated at least twice with similar results. F, A schematic representation of the gB-specific CTL epitope. The amino acid residue at each position in the peptide recognized by the gB-specific CTL clone is indicated below the schematic. The native gB epitope is indicated inside the circles. The H-2Kb-restricted, gB-specific CTL clone was used to determine the structural requirements at P2 for Ag recognition. Unlike the H-4b-specific CTL, the gB-specific CTL clone tolerated multiple amino acids at P2. Asp, Pro, serine (Ser), and threonine (Thr) and, to a lesser extent, Ala, Ile, Leu, and Val at P2 did not affect recognition (Fig. 6⇑A); note that the natural gB-derived epitope contains Ser at P2. These data are consistent with the finding that OVA-derived epitope, SIINFEKL, can accommodate Ala, Gly, Leu, Ser, Thr, and Val at P2 without affecting recognition by certain H-2Kb-restricted, OVA-specific CTL clones (18). Thus multiple structurally distinct amino acid residues can be accommodated at P2 of some H-2Kb-restricted CTL epitopes. This rule was tested using the H-2Kb-restricted, gB-specific CTL clone. Akin to H-4b-specific CTL clone, gB-specific CTL clone also recognized peptides containing multiple structurally distinct amino acid residues at P1 (Phe, Gln, Ser, and Trp, as well as Asp and Thr to a lesser extent; Fig. 6⇑B) and P6 (Ala, Phe, and Tyr, as well as Trp to a lesser degree; Fig. 6⇑D). At the remaining positions, the gB-specific CTL clone recognized only the residues represented in the native epitope, i.e., Glu at P4 and Arg at P7 (Fig. 6⇑, C and E). These data are summarized in Figure 6⇑F. Thus, although degenerate, the specific TCR interfaces Ag only when presented with common structurally conserved amino acid residues at one or two positions in the CTL epitope among the four putative solvent-exposed residues that may be accessible to the TCR. Efforts to date in elucidating the rules for T cell Ag recognition have relied on determining the effects of single amino acid changes within a peptide epitope on this process. Largely, such studies have utilized alanine-scanning mutagenesis, which provided key information on residues in the epitope that contact the class I molecule or the TCR (42, 43). In another approach, an epitope residue individually altered to several other natural l-amino acids has been used to determine the role of class I contact residues in binding the MHC molecule. This has led to the definition of secondary anchor positions (15, 17, 44). Very few studies, however, have attempted to characterize the role of peptide anchor residues in Ag presentation to, and recognition by, CD8+ T cells (18); most such studies have focused on the dominant anchor residues. To attempt a thorough analysis would require screening of ∼1.7 × 1010 individual peptide combinations for CTL recognition. Thus the combinatorial peptide library approach as reported here and by others provides a solution to massive screening for CTL recognition. The combinatorial library approach is not without limitations. First, it is difficult to ascertain the solubility of individual peptides in a complex library. The solubility problem was addressed in this study using a polyclonal population of CTL against BALB.B-derived multiple minor H Ags, which also includes the anti-H-4b reactivities, to probe the libraries. The results revealed that a reasonable proportion of the peptides in the libraries tested were in solution. Second, competition for binding class I could exclude peptide(s) in a library from being presented. However, fewer than 100 class I-peptide complexes are typically necessary for CTL recognition (45, 46); hence, this is unlikely to be a problem. Third, each peptide library would be expected to contain an admixture of agonistic and antagonistic peptides for a specific TCR (27). The recognition of the targets sensitized by peptides in a complex library by CTL, then, represents the effect of those agonistic peptides not inhibited by the antagonistic peptides in the library. Whether a set of antagonist peptides in library 1 inhibited the recognition of agonist peptides in this library by the H-4b-specific CTL clone could not be tested because the H-4b-derived epitope hitherto remains elusive. Notwithstanding, the combinatorial peptide library approach can provide useful information regarding TCR/class I-peptide interactions. Thus, synthetic combinatorial peptide libraries were used as an approach to define the rules for class I-restricted peptide Ag presentation and recognition. To avoid bias from the knowledge of a CTL epitope, the physico-chemical features of the unknown H-2Kb-restricted, H-4b Ag-specific CTL epitope was first determined using the combinatorial libraries. As expected, several mimotopes were identified. The physico-chemical features of the H-4b-derived mimotopes were compared with those of similarly derived mimotopes of two other H-2Kb-restricted, viral Ag (HSV-I gB and RR-1)-specific CTL clones whose epitopes are already known. This allowed the definition of two important structural features for class I-restricted peptide Ag presentation and recognition: 1) The display of Ag to H-2Kb-restricted TCR critically depended on the class I-contact residue at P3 of the peptide. In several instances the amino acid residue at P3 was more critical than the dominant PΩ anchor. 2) The TCR requires only one or two TCR-contact residues of the peptide to achieve specificity, while it can interact with multiple structurally dissimilar amino acids at the remaining solvent-exposed positions. The role of dominant anchor residues, P5 and PΩ in the case of H-2Kb-binding peptides, is thoroughly appreciated in numerous previous studies. Although the secondary anchor residues play an important role in peptide binding to class I molecules, their role in presentation of antigenic peptides to CTL is less clearly understood. A recent study demonstrated that the recognition of OVA epitope SIINFEKL by H-2Kb-restricted, OVA-specific CTL clones was altered by the structural features of the residues at P2. Nonetheless, although clone specific, these CTL clones tolerated structurally distinct amino acids (Ala, Asn, Gly, Ser, and Thr) at P2 in the SIINFEKL epitope (18). This is consistent with the finding presented here, in that the gB-specific CTL clone tolerates structurally distinct amino acid residues at P2 in its epitope. In contrast to the degeneracy at P2 in gB-specific CTL epitope, recognition by H-4b-specific CTL requires an invariant Gly residue at P2. On the other hand, appropriate presentation of H-4b and RR-1 Ags by H-2Kb critically depended on the nature of the residue at P3. Thus, residues at P3 serve as an important secondary anchor at least in appropriate presentation of Ag to CD8+ T cells studied here. The side chain of the residue at P3 is oriented toward the α2-helix and almost completely buried into pocket D in the three crystal structures of H-2Kb individually complexed with different peptides (8, 9, 21). Thus, residues at P3 probably assume the role of an important secondary anchor. A thorough x-ray crystallographic analysis of HLA-A2 individually complexed with five different peptides revealed that the secondary anchors can influence the orientation of the solvent-exposed residues without altering the conformation of the dominant anchors. Importantly, none of the peptides induced any significant variation in the HLA-A2 structure. Because the solvent-exposed peptide residues are accessible to the TCR, it was concluded that interactions with such residues would determine the antigenicity of the class I-peptide complex (47). Thus the results presented herein provide functional evidence for the role of secondary anchor residues, such as those at P3, in altering the antigenicity of the class I-peptide complex. The two recently solved crystal structures of TCR/class I-peptide cocomplexes have provided detailed information on how the receptor interfaces its ligand (23, 24). Based on these structures, we would predict that the CDR3β loop interfaces the carboxyl half of the peptide Ags derived from H-4b, gB, and RR-1. In this regard, it is noteworthy that the majority of the TCR expressed by over 15 distinct CTL clones against H-4b (48) and gB (49) contain an invariant acidic residue in their CDR3β loop. Being of opposite charge, the acidic residue in CDR3β can make a productive interaction with the basic Arg (H-4b and gB) or His (H-4b) residues present in the respective epitopes. This interaction may be important but does not impart the recognition specificity between the receptor and the ligand because the two CTL clones do not have overlapping epitopes or mimotopes. Thus, P6I and P4E of the H-4b- and gB-specific CTL epitopes, respectively, may play a key role in imparting specificity of the recognition process. Thus, very few atoms of the epitopes are essential for the specificity in Ag recognition by the TCR. Although much has been learned regarding how the TCR interfaces its Ag, the basis for the degenerate nature of the TCR/class I-peptide interactions remains to be established. Several studies have established that the interaction of the TCR with its ligand is of low affinity (50, 51, 52). These affinity values are similar to those for the interaction between IgM and its Ag and contrast that of IgG, which has a much higher affinity for its Ag (53, 54, 55). Consequently, the TCR/class I-peptide interactions occur with a slow on and fast off rates (50, 51). Calculations of the Gibbs free energy change accompanying the formation of Ab and Ag complexes revealed that the higher the affinity of the interaction, the greater the binding energy. Additionally, both the affinity and the binding energy are directly proportional to the number of amino acid residues that are critical in the Ab-Ag interactions (56). Thus, by analogy, the binding energy accompanying the ternary complex formation would be minimal, based on the physical parameters of TCR/class I-peptide interactions. The low binding energy of this reaction would suggest that the specificity of the TCR/class I-peptide binding is imparted by interactions between few atoms of the interacting components with the remaining large (∼600 Å2) interface area probably participating in physico-chemical complementarity. In support of the above model is the finding that the TCR of the H-4b- and the gB-specific CTL clones require only one of the four solvent-exposed residues in their cognate epitopes for effective Ag recognition. Additionally, this model would also assume a strict spatial positioning of the critical TCR contact residue(s) in relation to the remaining interface area on the class I-peptide complex for effective TCR/class I-peptide interactions. Thus, alterations in the strict spatial order of the critical TCR contact residues by differences in the secondary anchors, as seen with the H-4b- and RR-1-specific TCR, can affect TCR/class I-peptide interaction patterns. Finally, the above model for TCR/class I-peptide interaction also explains how a single TCR interfaces multiple ligands. Our finding that the TCR contacts only one or two of the four solvent-exposed residues of the peptide to achieve specificity is supported by the recently described crystal structure of the murine 2C TCR complexed with H-2Kb bound to self-peptide dEV8 (52). The dEV8 peptide is buried deep in the H-2Kb groove, hence contributing very little to the overall TCR/MHC-peptide interactions. Moreover, the interface between the 2C TCR and the H-2Kb-dEV8 complex has poor three-dimensional complementarity and has large empty spaces, making very few contacts with the peptide possible (52). Similarly, the A6 TCR/HLA-A2-HIV tax cocomplex also revealed poor structural complementarity at the interface between the receptor and its ligand (23). Thus, the poor complementarity observed in the above crystal structures explains why the TCRs studied here tolerate multiple structurally dissimilar amino acids at most of the TCR contact residues of the peptides presented by H-2Kb. In conclusion, akin to the class I-peptide interactions whose specificity is determined by the structure of the residues at select positions in the peptide (anchor residues), the TCR/class I-peptide interaction also requires only an amino acid or two among at least four available TCR contact residues within the peptide for specificity. In this manner a single TCR can interface multiple ligands. We thank M. H. Hunsinger, S. Roopenian, and J. M. Weaver for excellent technical assistance and M. E. Embers and L. Van Kaer for critically reading the manuscript. ↵1 This work was supported by Training Grant CA60395 (M.B.) and by Grants AI34070, CA25000 (S.S.T. ), AI28802 (D.C.R. ), and HL54977 (S.J.) from the National Institutes of Health. S.J. is the recipient of the American Cancer Society’s Junior Faculty Research Award. ↵3 Abbreviations used in this paper: β2m, β2-microglobulin; CDR, complementarity determining region; gB, glycoprotein B; HSV-I, herpes simplex virus type I; RR-1, ribonucleotide reductase-1. Harding, C. V.. 1997. MHC Molecules and Antigen Processing R.G. Landis Company, Austin TX.